At long last, I can post my finished response to the Horizons challenge. I contemplated the interesting insights from my fellow artists, and decided to create some sketches with undulating lines in my sketchbook. I was struck at one point, how the lines took on the look of a hilly landscape, and later, with how similar those lines were to the curvilinear shape of the human body. The result is a bit of a trompe l'oeil piece. 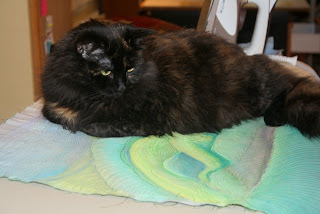 After painting the fabric, I played further with line by adding lines of quilting to provide perspective and dimension. I might well have entitled the piece "Ambiguity" because there is so much! Some viewers don't even see the figure at first. And is it a hillscape or bed coverings? And finally, where is the horizon - where does the land end and the sky begin? Or maybe it should be entitled "Perseverance" because of the many obstacles that hindered my completing the piece by the due date. My trip to Taiwan - the experience of a lifetime - stopped production midway; then a family trip took me away for five days; professional obligations took priority on my return, and I am starting a new day job. But the final straw last night was the cat deciding my quilt looked like a nice cozy spot for taking a nap. Now the piece is finished and ... what's this? The new challenge has been posted! Back to the drawing board, quite literally. No rest for the wicked! Yeah Mary! you did it and so beautifully too. Hope life settles down a little for you. Beautiful piece, Mary! And I wonder...what does one learn about oneself if one sees the figure first....? Beautiful Mary! I love what you did with the stitching!! You are right, there is so much in this piece. Yea for you! It is so beautiful! We conceived the beauty for the horizon challenge piece when you were in Taiwan. This is such an unforgettable memory. oh my gosh you got the IDEA in Taiwan?? This is just a stunning piece! What a marvelous piece! The colors, the lines, the movement all work in harmony. Stunning!! And I am awe-struck at the variations on the Horizon theme. Wonderful creativity!